Hello Everyone, and welcome to the final Newsletter for 2012. December seems to have arrived in no time, and now we have Christmas on our doorstep! I hope your preparations are coming along, and that all your wonderful handmade cards are ready to be sent off to someone special. Scrapville is entering into a 4th year Next Month. I have some new and exciting plans for 2013, and I hope you will be a part of our continued growth of creativity and crafting passions. Helping you find the inspiration you desire to create those special projects is also very rewarding for us at Scrapville, so I thank you for your support, and hope to see you again soon. The December Monthly Pack is available today. 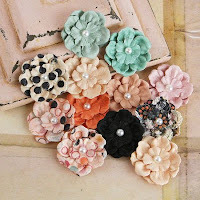 This month we are running with the beautiful Rondelle range from Prima, along with lots of gorgeous embellies. Here are some of the papers in the Pack. Also in the Pack are a variety of these Silentium paper flowers. The total abundence of this Pack includes: 2 x Cardstock, 6 x Doublesided Patterned Paper, 2 x Mini Alpha Sticker sheets, coordinating Paper Flowers and Wooden Shape, adhesive Bling shapes, a length of Black Trim, a metre of White/Cream ribbon, mixed buttons, journalling tags and a decorative lace embellishment. So much goodness to play with! This Pack is limited in-store whilst stock is available. Once gone, they're gone! The December Monthly Pack Winner will win the January Monthly Pack, so it’s a nice way to start the next month’s challenges knowing you’ve won yours! Pop on over to the Blog, or call into the shop to check it out. Scrapville's 2013 Creative Team Call has now closed, and the store will shortly be announcing it’s new lineup. As we commence the 4th year of trading in Wodonga, we will also be sharing the inspiration and creativity of the newest members of the Team for the January to June period. The November/December Sketch Challenge is up and running, and your challenge entries expire Pumpkin Time December 14th, so be sure to get yours in with time to wind down for Christmas. Anita has done a wonderful job designing Scrapville’s Sketches, which I hope you have at some point found the time to try. The November BCV was a wonderful class , which was taken by Sally in-store. This technique BCV gave the girls a hands-on look at a collage style of embossing, using Utee for a thicker, brighter effect. Due to the popularity of this class, it will be re-run as a class on Thursday night, 6th December at 7pm. Those that wish to attend will need to book to ensure there are enough kits available. You can find the list still uploaded to the side-bar on the Blog. Please note that to be eligible for the challenges we must have a minimum or four (4) entries in each. Each challenge has criteria to meet, whether it is using the pack products, sticking to the design of the sketch, or using products that can be purchased and supported by Scrapville. All challenges are voted for by the Creative Team. Anyone who wins a monthly challenge cannot win the following month’s challenge (to be fair to other entries) but are encouraged to share their challenge creations. Our Weekly Seniors Card Classes have proved very popular, with the girls making some wonderful cards. Running on Wednesday mornings at 10am, you’ll join Heidi and the girls for a morning out creating some beautiful cards. Please ensure you make your booking. Our Monthly Evening Card Classes will commence on the 3rd Thursday of each month, with the first one starting Thursday, 17th January 2013. Again you’ll need to book, and all classes include the kits. Anyone attending classes at Scrapville will be eligible for Class Discounts. These discounts will apply to all the products that are specifically required for use in the Class. Nice and Ezy, these kits have been put together to take the work out of choosing all your papers and their coordinating bits and pieces. We are adding to the selection and topping them up, so why not pop in and see what we’ve got for you. 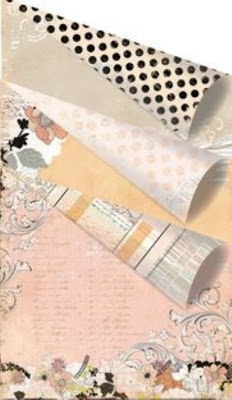 They are a great starter kit, which the Creative Team girls have used to create some wonderful scrapbooking pages. A great value Kits at just $10.00! If all you need is a Paper Pack, we also have some New ones available in-store, colour coordinated with 8 sheets of single sided papers, and all with a variation of patterns. Check them out at the front of the shop. The next CropVille, numbers permitting, is on Saturday 10th November from 7pm to 11.30pm. Please ensure you book in advance so that numbers are confirmed prior. You are welcome to scrap or make cards, or work on off the page projects. Bring a friend if you like, and have a creative night out. Anyone interested in attending a Christmas Wreath Class can contact Janet to make a booking. The sample is available to view in-store, and as this has been a very popular class we will fit one more in before Christmas. MS Scoreboards, Big Shot accessories, Grand Calibur Machine, Tombow Tape Runners, Glitter & Embossed Patterned Papers, more Cardmaking die cuts. The December/January DoCrafts Creativity Magazine/Stock is now in-store. I also have a Catalogue and Price Listing for the February/March DoCrafts Products in-store. Should you wish to specifically order stock items, please call into the store and complete your order, along with a 50% up front payment. This will ensure that your items are secured, as stock once landed is very limited if not initially ordered. This order will only be available until close of business Thursday, 6th December. 48 Page Sticker Books (for your gold & silver outline stickers), Dimensional Magic, Mod Podge, 12x12 Scrapbooking Albums in Black, Brown, Light Blue, Light Pink, Lime, Dark Red & Navy, Christmas Embossing Folders, Trimmers, Glimmer Mist re-fill spray bottles. New Lucky8 Punches, New Mini8 Punches, 12x12 Shadow Box Frames (no glass), 12x12 Frames (no glass), Prima Self Adhesive bling, Prima Distressing Tools.